When you choose a product with the Easy and Simple logo, you can be assured of high-quality products and services, like hundreds and thousands of our customers already do. If for any reason you are not completely satisfied, you can send the product back for a full refund or replacement. Changeable wooden felt message board sign 10x12 inch is an ideal gift for family members, friends, and loved ones. Our goal is to make your choice simple, easy and unforgettable. Classic felt letter board set is a unique opportunity to express your feelings so they stay memorable! Share funny moments, funny phrases, and motivational slogans with people around you. They will appreciate and remember your unique message! 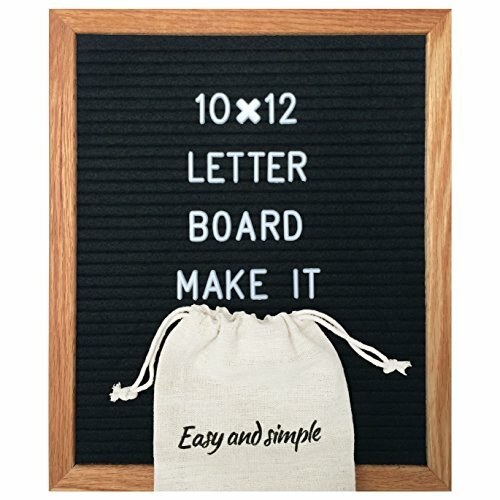 Felt letter board storage box and canvas bag with Easy and Simple logo on it is included. Cheap felt vintage letter board rectangle. "Easy and Simple" is not just a logo. It's our team's motto. Everybody loves decorative felt letter board kit. ✔ 10"x12" Wood Framed Letter Board. ✔ 340 Felt Letterboard Letters (3/4 inches). ✔ American Oak Wood Frame. Don't wait! Click the yellow Add To Cart button at the top of the page now! Optimal proportions. Specially developed, black felt letter board, 10x12 Inches. Bigger and prettier than the 10x10 inch wooden letter board. Holds more words. Small felt letter board with stand. The main advantage of the felt letter board sign is the detachable stand. Set this letter board on any surface. There is also a hook for hanging the retro felt letter board on a wall. We use only high-quality dark wood to produce the solid oak wood frame. It fits easily into any space. Cute felt letter board for kids. Includes white plastic pieces including letters, numbers, special symbols, punctuation marks and much more. Express your feelings without limitations. Premium black felt allows you to fix the changeable letters and prevent them from falling out. Ideal for home, office, or anywhere else! Don't miss this chance - order this magnificent set now! If you have any questions about this product by Easy and Simple, contact us by completing and submitting the form below. If you are looking for a specif part number, please include it with your message.